SNAPPER PATRICK from PAT'S FISHERMAN'S WHARF was a fantastic choice!! I will make this again and again, but next time I will go simpler and make it more of a casserole bake. Pick crabmeat, removing any bits of shell. Cut snapper fillets in half lengthwise. 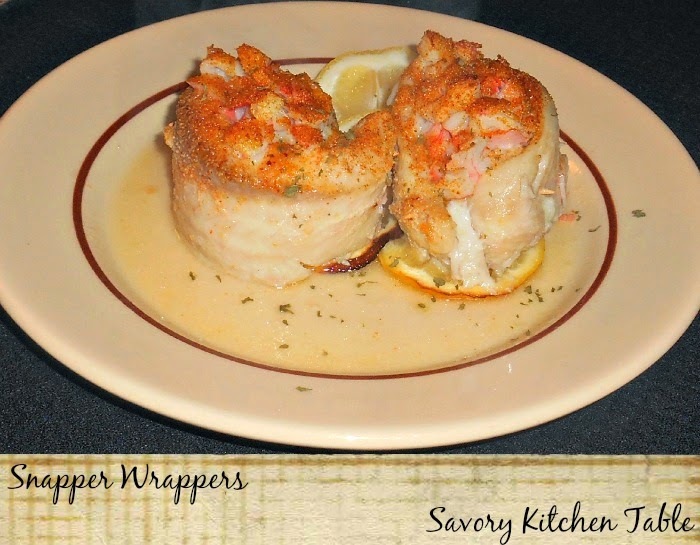 Top each fillet with about 1/3 cup crabmeat. Roll up fillets and secure with wooden toothpicks. Blend together the salt, garlic powder and red pepper. Combine melted butter and water in the bottom of your baking dish, blending well. Sprinkle 1 teaspoon of seasoning mix over top of the butter mixture. Arrange roll ups in baking dish. Sprinkle roll ups with remaining seasoning mixture. Bake uncovered for 16-18 minutes or fish flakes when tested with a fork. Spoon pan drippings over roll ups before serving.